Think, what if you could submit a few "choice words" to a personal book shopper—#mybookshopper—someone who wanders off into the bookish wild armed with only those words, to return sweatier and disheveled, hoisting a book over her head picked fresh just for you? Julie is just that Personal Book Shopper! 2) Facebook: Each contest will be created as a separate event. Like Canadian Bookshelf on Facebook and leave your choice words for Book Madam under the most current event listing. 3) Create a Canadian Bookshelf profile and leave your "choice words" in the comment field of each Personal Shopper Contest announcement. The first Personal Book Shopper contest will begin 10:00 a.m. ET, Tuesday, June 21 and will close 12:00 p.m. ET, Friday, June 24 with three winners announced the following Monday. 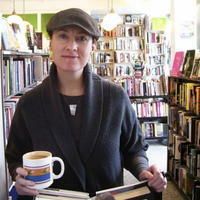 The chosen books will be announced a week from the day each contest closes in a video address from Book Madam herself. Publishers, if you'd like to show your support by donating prize copies to Canadian Bookshelf's Personal Book Shopper contest, please contact Julie Wilson at host@canadianbookshelf.com to indicate your interest. Booksellers, if you'd like to show your support by matching each prize with an in-store or online gift certificate, again, please be in touch with Julie Wilson at host@canadianbookshelf.com. Booksellers, librarians, readers, publishers, authors and book bloggers, if you'd like to be considered for our rotating panel of experts, you too can send an email to Julie at host@canadianbookshelf.com.